Ted Burke LIKE IT OR NOT: Does "Okay Computer" give good Radiohead? Does "Okay Computer" give good Radiohead? 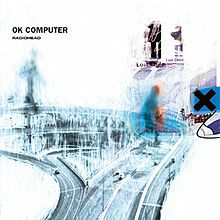 After several years of young fans and assorted bright acolytes telling me that I must have a listen to Radiohead's "Okay Computer" to experience one of the most important rock (or post-rock) albums ever committed to the ways of digital distribution, I finally did so, a close listen (or at least an earnest one), and found their enterprise wanting. Begging for attention seems more the appropriate response;through out the awkward angularity of the guitar bashings and inchoate mewlings of singer-songwriter Thom York's seeming parodies of a gruesomely awful poetry that needed to be placed under arrest in order to make the mendicant mediocrity cease, all I get is the callow ambition of some aging hipsters operating under the assumption that reframing, sort of, old modernistic gestures and blurring their glaring amateurism , we might come across Art, finally, and perhaps a relevant statement or two. Far less the game changer claimed by defenders, it never distinguished itself from the other skeins of slow-coursing sludge that one finds at the extra musical margins. It's Super Mope, the mostly unassembled tunes framed by accidental associations of chord, tempo, tuning. I've absolutely no doubt that Radiohead worked diligently, night and day, for hours and hours until there were no more hours, to make sure "Ok Computer" was as close to their ideal before they released it into the wild. That, sadly, does not make this an enjoyable or anything less than irritating. Few things in music listening are trying to some make sense of some feeble ideas that sound labored over. And yes, there are lyrics, and awful ones, to match the dopey dissonance Radiohead favors. Writing from the center of a depression one cannot shake is an honored tradition, at least in 20th Century American and British poetry, with the works of John Berryman, Plath, Lowell and too many others to mention attest. And certainly, manic lows are the source of a good many lyric writers who sought to write their way out of a bad head space. Their collective goal was, if one can use such a presumptuous term, was to leave something after them that would remain as art, instances of inspired writing, even if they failed to alleviate a malaise. Radiohead's rhymes, half rhymes and no rhymes seem more symptoms than wit, more fidgeting with a notebook and pen than a focused attempt to get at a fleeting set of moods or insights that won't quite lend themselves to common speech. It's a generational thing, I'm sure, and I reveal my age without having to tell you, but it actually is a matter of having seen this before, heard this before, having had this discussion before. The last five decade are crowded with thousands of nameless creatures at the margins of popular culture, convinced of their genius but unsure what that self-diagnosed brilliance consists of. The difference is that Radiohead caught a break. Well, good for them on that score.